Beginning Boutique is a cool online shop that stocks a great selection of dresses, tops and bottoms. They have familiar brands like One Teaspoon, Stylestalker, Finders Keepers – but they mix it up with affordable brands too, so you can also buy a great party dress for $55. They update their stock often, have heaps of styles and sizes available, have free shipping throughout Australia… and most importantly, their customer service is superb. I was very impressed with the range of colourful skirts and styles they offered. So I picked out a Stylestalker Skirt to try out – and it’s gorgeous! I’m a fan of the brand Stylestalker as they have some pretty bold (yet wearable) styles and their basic items always have a cool bit of detail on it that lifts up the whole garment. View the rest of Stylestalker items. The skirt is pretty versatile and feminine. 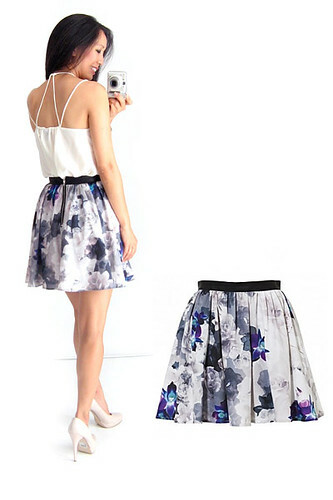 You can wear the skirt with a white, grey or black top. Or a clashing colour, like yellow?! You can wear it with a flowing, loose top, or a tight fitting body top. Outfit details: Top by In Good Company, Stylestalker Skirt, Colette Dinnigan x Lovisa necklace from The Iconic, Dorothy Perkins heels. Unfortunately this particular style is out of stock, but here are a couple of other skirts that I had my eye on. Check out the whole collection of skirts here. Also the range of dresses is pretty good too. As I said before, the price range is $39 – $179 for a dress. And there are heaps of items on sale that are also listed in the dress section here. What I like most about the shopping experience at Beginning Boutique, is that when you “view all the dresses”, all the dresses are listed WITH some little boxes that show what sizes are available, so you know straight away whether they have your size. Most of the time, you have to select your size, then it takes a few seconds to filter, then (sometimes) only 3 or 4 items are listed in that size and – well – that’s a bit boring because you don’t actually get to see the rest of the stuff the shop offers and you don’t feel like you’ve seen a good representation of what the shop has for sale. Basically it offers you an excellent “window shopping inspiration” experience too haha! Use the code “TENNER” at the checkout and you can enjoy 10% off your order when you spend $70 or over. Anyway, I hope you like it and hope you enjoy a touch of online shopping.